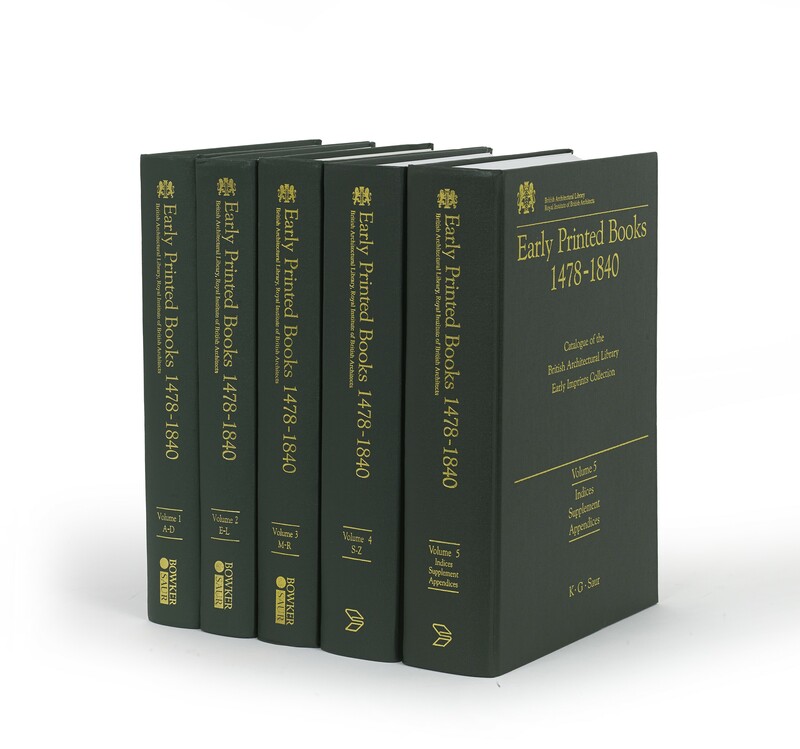 Five volumes (30.5 cm), I (1994): xlviii, 538 pp., including frontispiece and 16 p. of plates. II (1995): xxii, pp.539-1039 (1), plus frontispiece and 16 p. of plates. III (1999): xxvi, pp.1041-1715 (1), plus frontispiece and 16 p. of plates. IV (2001): xxviii, pp.1717-2479 (1), plus frontispiece and 16 p. of plates. V (2003): xxxv (1), pp.2481-3267 (1), plus frontispiece and 16 p. of plates. 4202 catalogue entries. Uniform publisher’s green cloth (no dust jackets issued). - Analytical catalogue of the Royal Institute of British Architects’ rare book holdings. ¶ Fine set with minimal traces of use and no marks of ownership. (30.5 cm), xlviii, 538 pp., including frontispiece and 16 p. of plates. 960 catalogue entries. Publisher’s green cloth. - “What distinguishes it from most earlier bibliographical catalogues of architectural books is that its compilers not merely describe and collate the BAL’s copies, but have checked them against British Library and other copies, and have tried wherever possible to elucidate the books’ publishing histories and to account for any observed peculiarities in their collations… Those prepared to bite the bullet and invest in this catalogue will not regret their decision” (from a review by Hugh Pagan, in Antiquarian Book Monthly, April 1995, pp.26-27). Reprinted Munich: K.G. Saur, 2003 (ISBN 3598240546). (30.5 cm), xxii, pp.539-1039 (1), plus frontispiece and 16 p. of plates. Entries 961-1984. Publisher’s green cloth. - “The catalogue is often a real gold mine of information, and the antiquarian bookseller, librarian, or book collector who imagines that all he or she will find in it are abstruse pieces of information about obscure architectural books are due for many surprises” (from a review by Hugh Pagan, in Antiquarian Book Monthly, May 1996, p.24). (30.5 cm), xxvi, pp.1041-1715 (1), plus frontispiece and 16 p. of plates. Entries 1985-2881. Publisher’s green cloth. (30.5 cm), xxviii, pp.1717-2479 (1), plus frontispiece and 16 p. of plates. Entries 2882-3740. Publisher’s green cloth. - The present volume includes Scamozzi (14 entries), Serlio (12 entries), Vignola (39 entries), and Vitruvius (54 entries). “For Scamozzi the editors have contributed an invaluable chronological survey, with locations, of all fifty-seven known editions of the Idea della architettura universale, from 1615 to 1838 (the year following Scolari’s early attempt at a bibliography of Scamozzi). 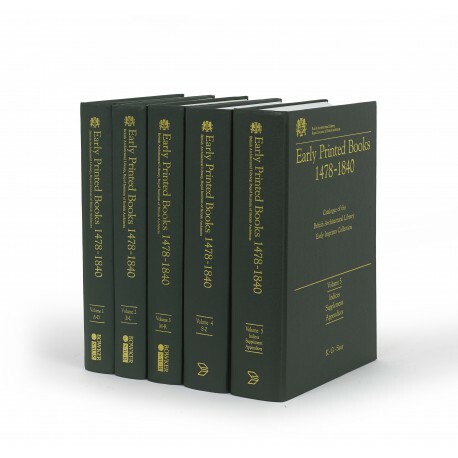 A similar survey is provided for the more complex Books 1-5 of Serlio, including the Extraordinario libro of 1551, Book 7 of 1575, and Book 6 unpublished until the twentieth century, as well as the various collected editions. The nightmare of Vignola’s Regola delli cinque ordini d’architettura is also treated in exemplary fashion with a listing of the eighty-nine editions to 1700, and takes up some sixty pages of the catalogue. It is unlikely that anyone will improve on this masterly summary of such intractable material” (from a review by Paul Grinke, in The Library, seventh series, volume 4, 2002, pp.323-324). The Library’s two copies of the undated editio princeps of Vitruvius are assigned to the Roman press of Eucharius Silber and dated “1486?” (the copy at Corpus Christi, Oxford, was bought in Rome on 16 August 1487). (30.5 cm), xxxv (1), pp.2481-3267 (1), plus frontispiece and 16 p. of plates. Entries 3741-4202. Publisher’s green cloth. - The foreword to the catalogue by Peter Fuhring surveys past cataloguing of architectural books, and claims that the BAL catalogue “offers a model for future generations of bibliographers”. The “Supplement” catalogues architectural periodicals (entries 4182-4202), books omitted from previous volumes for various reasons, and some recent acquisitions; the substantial “Addenda and Corrigenda” (pp.2481-2510) presents new attributions, additional publication details, and details of copies held by other libraries. Reviewed by Paul Grinke, in The Library, seventh series, volume 5 (2004), p.76; by Claudia Funke, in PBSA, volume 98 (2004), pp.365-367.